Embedded fanless: Please contact your nearest Acrosser sales team for further price and sample availability information. Please contact your nearest Acrosser sales team for further price and sample availability information. 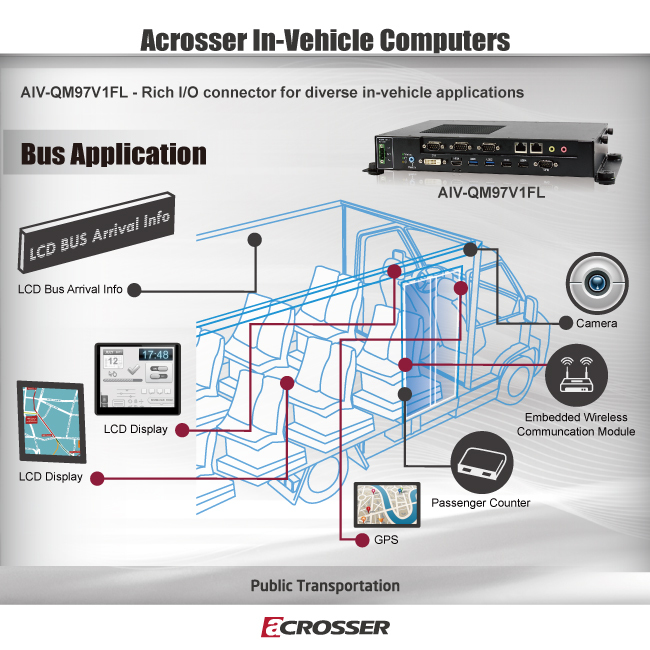 ACROSSER Technology, a world-leading in-vehicle computer supplier, announces the launch of its fanless in-vehicle pc, AIV-QM97V1FL. This rugged compact x86 embedded computer is dedicated to use in the in-vehicle computing industry. Equipped with a 5th generation Intel® Core™ i Broadwell U processors, the model provides sufficient computing power for simultaneous handling of a variety of vehicle applications. Car pc AIV-QM97V1FL supports one HDMI and one DVI port for video interfacing. Other I/O includes three COM ports, two USB 3.0 ports, two USB 2.0 ports, two LAN ports, one GPIO, and one remote switch cable. The versatility of the I/O interfaces makes bus pc AIV-QM97V1FL an ideal platform for systems integration projects, particularly in telematics, data recording systems, fleet management and logistics management. Finally, the capability for BIOS modification enables system engineers to achieve smart power management in their vehicle pc projects. Please contact your nearest Acrosser sales team for further price and sample availability information.